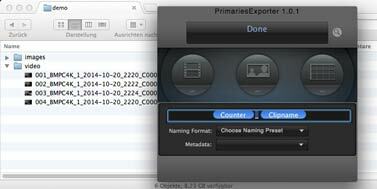 In order to export your Final Cut Pro X project to PrimariesExporter you´ll have to add a new Shared Destination. 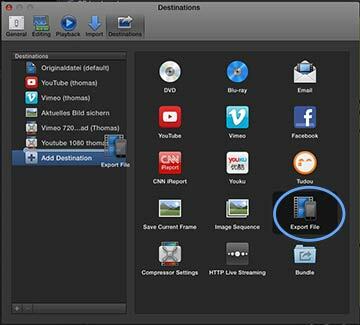 Open File > Share > Add Destination… You add a destination by dragging the “Export File” destination to the Destinations list on the left. (Optional) Setup the required codec and resolution. Click the “Open with:” dropdown and choose “Other…”. Navigate to the PrimariesExporter app, select it and click “Open”. Now your Shared Destination is setup and you can export a project from the Share menu or Share button. When you export your whole project (or a range of it) from the Share menu or Share button, Final Cut Pro X opens the Share window. If you like, you can change the description or modify some settings. Then click the “Next…” button. 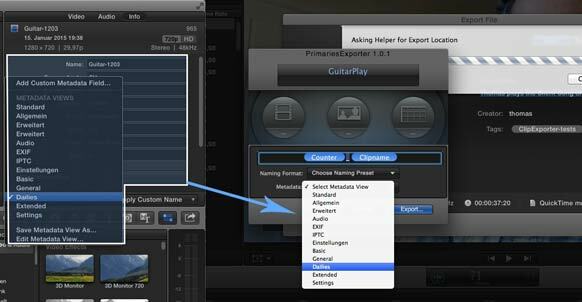 Final Cut Pro X launches PrimariesExporter. Select a naming format. 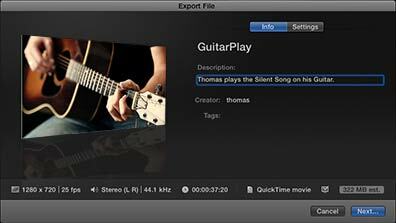 (To learn more about naming formats see this ClipExporter video). If you require metadata (at least for the metadata list) then select a metadata view name from the dropdown. 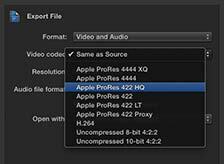 The metadata set names represent the metadata views and their fields in Final Cut Pro X.
Click “Export…” and choose a folder for the output videos, images etc. Click “Run”. 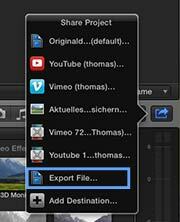 Final Cut Pro X starts rendering your timeline. PrimariesExporter shows up automatically when the rendering is finished. Click the magnifying glass icon to reveal the output folder.